Purchase online in India ZigBee XBee S2C RF Module at low price from DNA Technology, Nashik. XBee RF modules provide OEMs with a common footprint shared by multiple platforms, including multi-point and ZigBee/Mesh topologies, and both 2.4 GHz and 900 MHz solutions. OEMs deploying the XBee can substitute one XBee for another, depending upon dynamic application needs, with minimal development, reduced risk and shorter time-to-market. 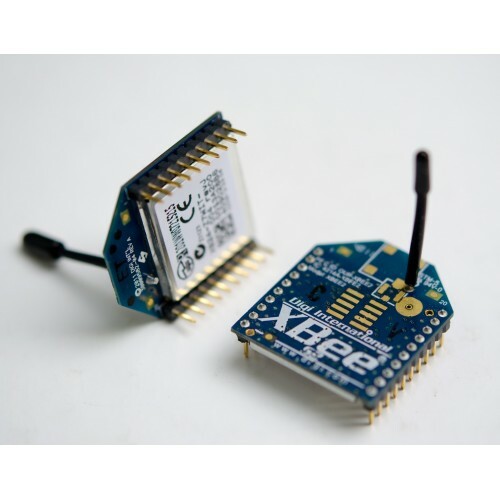 XBee 802.15.4 RF modules are ideal for applications requiring low latency and predictable communication timing. Providing quick, robust communication in point-to-point, peer-to-peer, and multipoint/star configurations, XBee 802.15.4 products enable robust end-point connectivity with ease. Whether deployed as a pure cable replacement for simple serial communication, or as part of a more complex hub-and-spoke network of sensors, XBee 802.15.4 RF modules maximize performance and ease of development. XBee 802.15.4 modules seamlessly interface with compatible gateways, device adapters and range extenders, providing developers with true beyond-the-horizon connectivity. The updated XBee S2C 802.15.4 module is built with the SiliconLabs EM357 SoC and offers improved power consumption, support for over-the-air firmware updates, and provides an upgrade path to DigiMesh® or ZigBee® mesh protocols if desired.